Saved from the trash can, long enough to satisfy my curiosity. 1/50 sec., f/5.3, ISO 200, 40mm. YOU NO DOUBT HAVE YOUR OWN “RULES” as to when a humble object becomes a noble one to the camera, that strange transference of energy from ordinary to compelling that allows an image to do more than record the thing itself. A million scattered fragments of daily life have been morphed into, if not art, something more than mundane, and it happens in an altogether mysterious way somewhere between picking it and clicking it. I don’t so much have a list of rules as I do a sequence of instincts. I know when I might have stumbled across something, something that, if poked, prodded or teased out in some way, might give me pleasure on the back end. It’s a little more advanced than a crap shoot and a far cry from science. With still life subjects, unlike portraits or documentary work. there isn’t an argument about the ethics or “purity” of manipulating the material….rearranging it, changing the emphasis, tweaking the light. In fact, still lifes are the only kinds of pictures where “working it” is the main objective. You know you’re molding the material. You want to see what other qualities or aspects you can reveal by, well, kind of playing with your food. It’s like Richard Dreyfuss shaping mashed potatoes into the Devil’s Tower. If I have any hard and fast rule about still lifes, it may be to throw out my trash a little slower. I can recall several instances in which I was on my way the garbage can with something, only to save it from oblivion at the last minute, turn it over on a table, and then try to tell myself something new about it from this angle or that. The above image, taken a few months ago, was such a salvage job, and, for reasons only important to myself, I like what resulted. Hey, Rauschenburg glued egg cartons on canvas. This ain’t new. My wife had packed a quick fruit and nut snack into a piece of aluminum foil, forgot to eat it, and brought it back home in her lunch sack. In cleaning out the sack, I figured she would not want to take it a second day and started to throw it out. 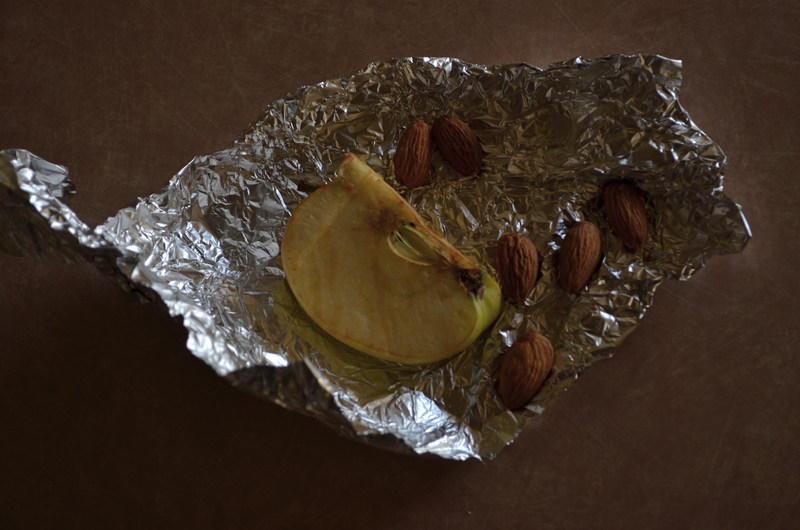 Re-wrapped several times, the foil now had a refractive quality which, in conjunction with window light from our patio, seemed to amp up the color of the apple slice and the almonds. Better yet, by playing with the crinkle factor of the foil, I could turn it into a combination reflector pan and bounce card. Five or six shots worth of work, and suddenly the afternoon seemed worthwhile. Fruits and nuts, to be exact. Hey, if we don’t play, how will we learn to work? Get out on the playground. Make the playground. And inspect your trash as you roll it to the curb. This entry was posted on August 5, 2012 by Michael Perkins. It was filed under darkness, Exposure, ISO, Light, low light, Patterns, Still Life, Textures and was tagged with Composition, Experiment, light, Still Life. Just so glad I’m not the only one!!!!! No, everyone who slings a camera over their neck learns to “see the beach in a grain of sand”….